I love going to Devi’s Corner when I’m hankering for a good thosai or roti telur bawang. They started serving Banana Leaf Rice a few months back but I only got around to trying it 2 weeks ago. 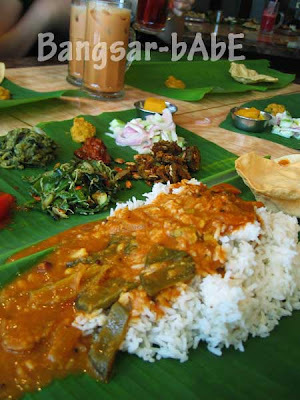 Banana Leaf Rice is served on the 1st floor while the ground floor remains as the “mamak”. There were 5 side dishes to go with white rice served on top of a large banana leaf. I found them quite tasty, especially the red one on the left. Not sure what it is though – tomato sambar or tomato curry? The portions were pretty generous, unlike another “famous banana leaf rice place” nearby. There are three types of curry gravy to choose from – dal, chicken and fish curry. The papadam was freshly fried. Crunchy and very nice with curry-drenched rice. I was pleasantly surprised with their complimentary dessert – I think it’s a type of barfi (the yellow piece on the small metal place). Sis and I ordered a piece of fried chicken each (pardon the blur picture). Well-fried, the chicken was crispy on the outside and juicy on the inside. I liked it better than the often over-fried chicken from the other “famous banana leaf rice place”. Lunch cost RM 32 for the 4 of us. That’s for 2 Banana Leaf Rice, 2 fried chicken, 3 thosai masala and 3 teh ais. Pretty reasonable don’t you think? Verdict: My new favourite place for Banana Leaf Rice. Hi, I’ve tried only the ground floor mamak rice, also quite tasty. This one looks nice also, should give a try!!! 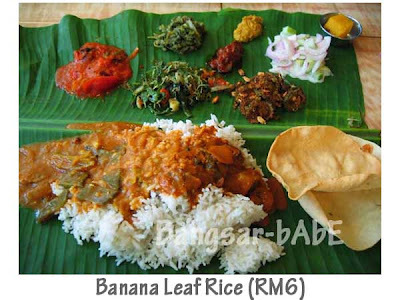 Hmm… what is the “other famous banana leaf rice”? Cannot say the name one ah, lol! Could it be the same one whose USJ shop i just blogged about? They had overfried dried chicken too…LOL! Hehe…too close to Devi’s Corner ma. I don’t understand why they are so popular when the food is average and no QC! i guess it Sri Nirwana ryt ? ehm… so far i think the service there is nice and the food is nice . maybe sumday i’ll try Devi’s Corner but from the pic doesn’t look that appetizing though 😛 . Thanks for the comment and for dropping by! It was better than Nirvana at that the time I posted this. However, the quality has since dropped, and they simply charge customers as they like. Oh is it . Yeah i agree about the service in Nirvana is good and they are friendly too . The price also is reasonable . I always lepak there with my colleagues after work 🙂 . Yup, I like how quickly the food and workers are generally friendly! Ive been eating in Bangsar and Devi's Corner has been my all-time low cost indulging corner.After my Saturday dance and Sunday Yoga, i walk to Devi's for South Indian food and was never charge extra for it has been years eating there. Its a high possibility that you've been charged for the services. For example, if you were seated downstairs than its normal price while located upstairs are charged a little extra.They have their kitchen to cook for the food being served upstairs therefore prices are charged accordingly. Hope to meet you someday at Bangsar!